In dullness and dreariness of February, I find that my mind starts to turn toward escape. WIth the holidays well behind us and spring still weeks and weeks away, getting away from the chill of the end of winter starts to sound more and more appealing. The smell of the lemon groves, the sound of the sea, and the sights of the vibrant Italian marketplace begin to have an appeal that is almost irresistible this time of year. And rather than fight the urge for new scenery and new skies, why not embrace your wanderlust? Whether you are looking back on memories of an amazing adventure or you are dreaming of your next trip, it is so much fun to wallow in your love of travel. 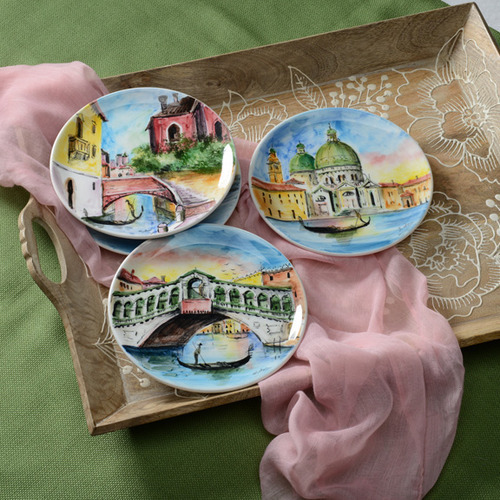 Our Veneto collection is a great way to remember your travels, helping to breathe life into the sights and memories of Venice. Each scene depicts a gondolier guiding his boat through the exquisite Venetian cityscape. It is truly a collection that honors the spirit of travel – in each piece, the scenery undergoes dramatic changes, but the gondolier remains the same as he moves through one of the most beautiful cities in the world. The Next Series Location? You Decide. At Modigliani, the thing that matters the most to us is our relationship with you. That’s why we want your input. We’re moving the location for our next series, and the question that we want to pose to you is where? Are you excited about seeing our artists interpret the Renaissance architecture of Florence? How about the eternal spirit of Rome? It’s up to you! If you can dream it, we can make it a reality in our next collection. Connect with us on Facebook or Twitter to vote on the location for our next collection. Let’s embark on our next adventure: to embrace la grande vita every day, together!